Gus Wilson drove up to the shop door of the Model Garage much earlier than usual that cold, late November morning, but not so early that he didn't meet his partner, Joe Clark, as he hopped out of his car and hurried around to the office door. They didn't do more than exchange amiable grunts of greeting until Joe had unlocked the door and they were in the warm little office. Then they grinned at each other. "I'm relieved to see that new oil heater of yours does the job," Gus said. "By golly, the old mercury sure went into a nose dive last night. It was down to twelve above, 'long about three o'clock, the traffic cop up at the circle told me. It's not more than a notch or two above twenty now. I'm betting that we're going to have a busy morning." Joe Clark nodded. "Sure to," he agreed, "I've told every customer that he'd better get antifreeze in his radiator and have his oil changed, but it has been so warm that a lot of them have kept on putting it off. Now this cold snap cracking down on us like this is going to have the putters-off right up to their chins in grief." The telephone rang noisily. "It's starting," Gus said. "Answer it, Joe, will you? I just haven't got the heart." He went into the shop and began changing into his working clothes. In a couple of minutes Joe stuck his head in at the door. "Might have known it!" he said grinning widely. "It was Mrs. Miller. Says her radiator is frozen solid, and will we send someone over right away to get her car started? Henry's been out of town, and she left their bus out in their driveway all night -- meant to put it in the garage, but forgot it. of course. Well, I've got to call her back. What'll I tell her?" "Tell her we'll have to thaw her radiator out over here," Gus said. "I'll send Harry up with the wrecker to get her car as soon as he shows up." A car had stopped outside and its driver was walking into the shop -- a big man whose red, weather beaten face looked over the upturned collar of a fuzzy old ulster. He gave the Model Garage partners a stare and demanded gruffly: "Which one of you fellows is Gus Wilson?" "I am," Gus told him. "My name's Higgs," the newcomer said I'm from upstate a ways -- building contractor. I'm having trouble with my darned car. I can't figure out what's the matter with it, and neither can anyone else -- although in the last couple of hours two garage men have taken my money for trying. Up the road a piece she went dead on me again, and while I was trying to get her going a motorcycle cop comes along. 'Gus Wilson, down at the Model Garage, is your best bet,' he told me. 'He's a trouble-shooter from 'way back.'' So, here I am." "Glad to have you," said Gus, "Well, what's your trouble?" "What is my trouble," Higgs answered, "is what I want to know. All I can tell you is what ain't the matter with my car. She ain't froze, because I had her filled up with antifreeze last week. There's nothing the matter with the oil or grease, because I had 'em changed only yesterday. The battery's all right -- got a kick like an army mule. She ain't exactly what you'd call a new car. I bought her secondhand back in '34 and she's got seventy-some thousand on her. But she never acted up on me like she's done this morning. "I've got some important business to attend to in the city, so I left home before six -- been over two hours coming thirty miles! About five miles from home, I was going along all right, doing maybe forty-five, when all of a sudden the car slowed down. Pretty soon she was just crawling along, and then, when she got to the top of a hill, she stopped dead. "I got out, and opened up the hood, and felt the plugs and the engine and the bottom of the radiator. They all felt nice and warm -- which was a heck of a lot more than I did, with that icy cold wind trying to blow both me and the bus back down the hill. I couldn't see anything wrong, so I got in again, turned the key, and stepped on the starter. And she started, and ran along fine! "Everything was all right -- for maybe two miles. Then she slowed down again. This time I just made an all-night garage before she went dead again. The mechanic and I pushed her in, and then he went over the plugs and the wiring, same as I had. "Try it now, he said after he'd fooled around for a while. I did, and she started nice and easy, and ran fine. 'That'll be a half a dollar,' he told me, so I paid him and drove off. "But after a couple of miles, she began to slow down again. I was going through a town, and I made it to a garage. The fellow there listened to what I had to say, and then said that the trouble was that there was water in the carburetor. So he took the carburetor off, blew it out, put it on again, and charged me a dollar! I just made it to your place -- motor went dead right at your door. Now, what I want to know is what the heck -- "
"Drive your car into the shop," Gus interrupted. "I'll soon fix it up so that it will stay fixed." "You'll have to give me a hand," Higgs retorted. "I told you she'd gone dead. We'll have to push her in -- unless maybe she's changed her mind again." Higgs drove in, looking disgusted. "That fellow who said that the trouble was water in the carburetor was almost -- but not quite -- right," Gus told him. "What happened was that the rush of cold air blowing around the carburetor -- especially while you were bucking that icy head wind that you told me about -- got it so cold that the moisture in the carburetor froze and built up a little plug of ice around the jet. When that plug got big enough it closed the opening and, of course, shut off the gas, and your engine stopped. As soon as your car stopped moving, the freezing rush of cold air stopped too -- or at least became less strong. Then the heat from the engine had a chance to warm up the carburetor enough to melt the little ice plug. And as soon as that happened, your car ran all right again." "I'll be darned!" 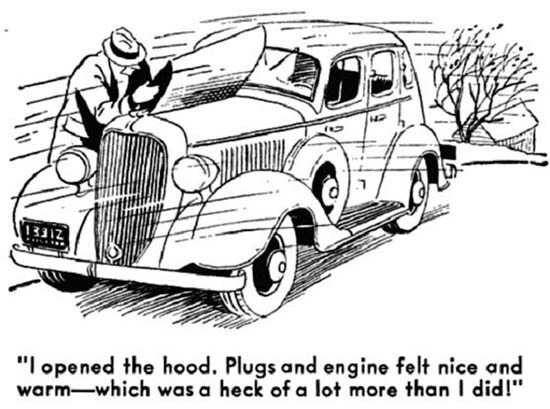 Higgs exclaimed, "But say -- you haven't looked under the hood. Are you certain that you're right about this?" "Dead certain," Gus assured him. "Well, then," Higgs continued, "now you know what's the matter, what are you going to do about fixing it?" "That's easy," Gus said. He took off the air filter, attached a length of flexible tubing to the air intake of the carburetor, and than made the tubing fast alongside the exhaust pipe and manifold. "There you are, Mr. Higgs," he said when he had finished. "Now you'll get warmed air in your carburetor no matter what happens and you won't have any more trouble. Am I sure? Sure I'm sure! If it doesn't work, stop in on your way home and I'll give you back your money!" As Higgs drove on his way, Harry came in, towing the Miller car. But before he was able to get started on the job, Joe's voice sounded from the office. "Hey, Gus! Send the wrecker over to Doc Foley's house. He says he can't start his car and wants you to tow it in." "Go get it," Gus told Harry. In ten minutes Harry was back, with Dr. Foley at the wheel of the car being towed. "Can't imagine what has gone wrong," the doctor said when he got out. "I've taken all the cold weather precautions that your partner suggested, Mr. Wilson -- my garage is unheated, you know. The car was running well when I came in from some calls late yesterday evening, but this morning I can't get it to start. It turned over two or three times when I stepped on the starter, and then quit cold." "Try it again, Doc," Gus said. "Throw your clutch out. No use using up your battery making it turn the transmission gears in grease that's so thick it's pretty nearly solid." Dr. Foley nodded, and pressed the starter pedal. The engine coughed weakly three or four times, and then stopped. "Once more , please," called Gus, who had walked around back of the car. The same thing happened, only the coughs were weaker. "Hand me that wrench, will you, Harry?" Gus said as he crawled under the car. Some minutes later he emerged with the car's muffler in his hand. "Now try again, Doc." This time the engine started with a roar. "All right," Gus yelled over the noise, "Switch it off." Dr. Foley got out, and Gus held up the detached muffler for his inspection. When he tapped it with the wrench, it gave off a curiously dull sound. "Frozen!" Gus said. "See what's happened? It was so cold last evening that vapor -- exhaust gases are mostly vapor, you know -- kept condensing in the muffler and freezing there. You didn't drive far enough between your calls to heat up the muffler and melt the ice or drive it out; and while the car was standing in your unheated garage overnight, the muffler froze to such an extent that when you started the engine, the back pressure soon stalled it. "Some mufflers have a small hole drilled in the bottom to allow that moisture to run out. But I'll tell you something that is a lot more certain than that hole is to do the job, Doc. Just remember, in cold weather, to race your engine for a few seconds before you shut it off. That will blow out any moisture that has accumulated in the muffler. All right, Harry, get Dr. Foley's muffler thawed out, and put it back on his car, so that he can be on his way." Along about five o'clock that afternoon, Mrs. Miller came in on the verge of tears -- and drove out smiling happily because her car wasn't ruined after all, and because her chronic forgetfulness wasn't going to cost her long-suffering spouse anything more than the charge for the time that Harry had spent in slowly thawing out the frozen radiator. Just then a horn honked insistently outside the ship door. Joe went over and looked out of the window. "It's young Jim Jelliff," he said, as Gus opened the doors to allow a small business coupe to enter. The young man who got out of it looked badly worried. "Hello, fellows," he said. "Looks like I'm in real trouble this trip." "Why," Gus said, you ought to be the happiest guy in town. Coal orders can't be hard to get in this sort of weather." Jim Jelliff smiled briefly, "Oh the coal business is good enough," he admitted. "But something is radically wrong with my car. I'm afraid that fixing it is going to be an expensive job. Look it over, will you, Gus?" "I certainly will," Gus assured him, "just as soon as you've told me what it is you want me to look for." "There's something wrong with the oil," the young man said. "When I started out this morning, I noticed that my engine was making an unusual lot of noise. I'm always careful about my oil, and when I had it checked at a service station I nearly dropped dead when it took almost a complete refill to bring it up to the level. "I was busy running around all morning. Two or three times, when I came out of some place to get in the car, I noticed that oil was dripping out of the bottom of the engine. That worried me, and early this afternoon I had the oil checked again, at another service station. Darned if she didn't take almost two quarts! The fellow who put it in said that he thought that instead of circulating the way it should, the oil was just shooting out of the motor -- and, if so, I was in for a big job. So, as soon as I could get the time, I came along to you. What's the matter?" Gus lifted the hood. 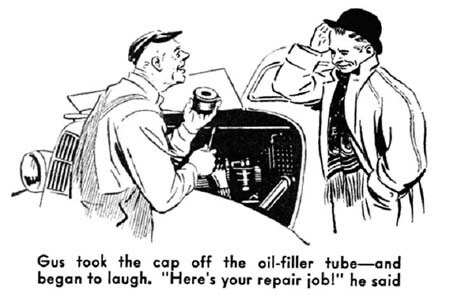 Then he took the cap off the oil-filler tube -- and began to laugh. "Nothing to get gray-haired about, Jim," he reassured the worried young man. "All this job is going to cost you is what you paid for the oil you wasted,. All that is the matter is that the moisture from the oil froze on this fine screen over the mouth of the filler tube. Your car doesn't happen to have a crankcase breather pipe, so the blow-by past your pistons builds up pressure that's been forcing oil out through your engine's main bearings. "Well, here's your repair job!" He took a small screw driver out of his pocket and loosened up the steel wool that formed the filter. "These holes are too large to freeze over. You won't have any more trouble." The clock in the office struck five, Gus yawned and stretched his powerful arms. "Quiting time," he said, grinning at Joe and Harry. "Well, another day, another dollar!" Joe Clark glanced over the numerous job slips that he had taken out of the clip hanging over Gus's bench. "Quite a few dollars today," he said contentedly. "But of course you wouldn't think of that!"